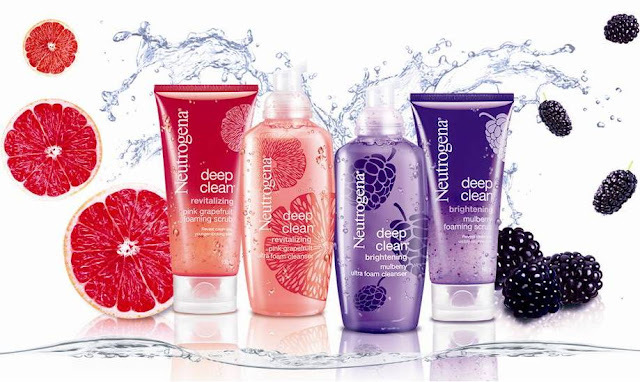 Neutrogena facial cleansers that brighten and revitalize skin with mulberry and grapefruit extracts. Neutrogena dives into new depths with the launch of two new series under its Deep Clean range – Neutrogena Brightening Mulberry and Neutrogena Revitalizing Pink Grapefruit. The mulberry extract of the Neutrogena Brightening Mulberry helps reveal visibly fairer and brighter skin, while the pink grapefruit extract of the Revitalizing Pink Grapefruit is great for eliminating dead skin cells for younger-looking and healthy skin. Like all facial cleansers based on Neutrogena’s Deep Clean technology, the two new series also effectively removes 99 percent of dirt, oil, impurities and dead skin cells, leaving skin clear and vibrant. Both series feature the ultra foam cleanser, which cleans deep down into pores with rich fine foam that forms as it dispenses from the product bottle; and the foaming scrub cleanser which contains gentle exfoliating beads to remove dead skin cells. Both format works to reveal a more radiant and lively complexion within. Treat your skin to the brightening and revitalization that you have always wanted! The Neutrogena® Deep Clean® Brightening Mulberry and Revitalizing Pink Grapefruit ranges are available at major pharmacies nationwide.